Last night, the Tigers and Mariners squared off in a mid-week contest in front of 14,981 fans in Seattle, in a game that didn’t begin until 10:00 pm on the east coast. The Tigers are a good baseball team, and are expected to win the AL Central by a significant margin. The Mariners are a less good baseball team, and aren’t expected to be in the playoff race when the year ends. At the end of the year, there’s a pretty good chance that the outcome of this game isn’t going to have determined anything. It will get lost in the shuffle of history as just another regular season game. But, oh man, this game was not just another game. This game was amazing. Let us count the ways. (Be warned, for there are some GIFs after the jump). Felix Hernandez and Max Scherzer can both be dominating right-handed hurlers. Last night, they played a game of Anything You Can Do I Can Do Better, and it was amazing. Here, see for yourself. Hernandez and Scherzer both faced 29 batters and got 24 outs. They both struck out 12 of those 29 batters. Hernandez threw 76 of 106 pitches for strikes. Scherzer threw 75 or 105 pitches for strikes. Hernandez got 19 swinging strikes. Scherzer got 19 swinging strikes. Overall, you have to give the slight edge to Hernandez. Not only was his overall line slightly better — 0.00 ERA, 0.08 FIP, 0.43 xFIP compared to 1.13 ERA/0.46 FIP/1.14 xFIP — but he did it against the significantly better line-up. Even after last night’s beat down, the Tigers have a .334 wOBA (#6 in MLB), while the Mariners are at .286 (#26 in MLB). Scherzer was ridiculously great, but he was great against a bunch of guys who aren’t hitting. Felix destroyed a line-up that is among baseball’s best. But, their combined performance is really the remarkable thing here. Between them, they posted a final line of 16 IP, 10 H, 2 R, 1 ER, 1 BB, 24 K. They combined for a 0.27 FIP. It was one of the best pitcher’s duels we’ve seen in recent times. Since 1974, there have only been five other games where both starting pitchers went at least 7 innings, had either zero or one walk, and struck out 12 batters or more. The last time it happened, Mark Prior threw a complete game shutout of the Expos, out-dueling Javier Vazquez in the process. There was also a Mussina/Pedro match-up in 2001, Clemens/Erickson in 1998, Sanders/Reynolds in 1995, and Johnson/Langston in 1992. That’s the full list of other games we’ve seen in the last 40 years where two starting pitchers squared off and blew away the competition in this fashion. Oh, the strikeouts. Yes, the starting pitchers contributed 24 of them, but there were 16 more strikeouts after the two starters headed for the showers. With 40 strikeouts, the game tied for the second most punch-outs in a single game in MLB history. The only time fans have ever seen more swinging and missing was a 20 inning affair between the Milwaukee Brewers and California Angels back in 1971, when they combined for 43 strikeouts. They also had an additional 37 plate appearances to get those extra three strikeouts, so that game essentially just got the record because it went so long. This game, though, was historic even for just its strikeout rate. It wasn’t the highest K% two teams have ever posted in the same game — that belongs to the day Kerry Wood struck out 20 Astros in 1998 — but a combined 38.8% K% over 15 innings is still a pretty epic accomplishment. Matthew Carruth sent me a list of the highest combined strikeout rates in in MLB history, and while there have been 31 with a higher combined strikeout rate, most of those were nine inning affairs that involved between 60 and 70 batters coming to the plate. Among games where at least 75 batters came to the plate, last night’s Tigers-Mariners match-up had the third highest strikeout rate in baseball history. Remarkably, both of the two long games with a higher K% have also taken place in Seattle. In 1997, the Mariners and Rangers combined for 31 strikeouts in nine innings — yes, Randy Johnson started for Seattle — but because there were six runs scored, the line-ups turned over a little more often and 77 men came to the plate. At 40.3%, it is the highest K% game with >=75 batters coming to the plate, just edging out this Mariners-A’s game from 1986, where 30 of the 77 batters struck out, primarily thanks to the dominance of Jose Rijo. Fielder was a wrecking ball the first two weeks of the season. He came to Seattle with a .429/.527/.833 line, and he had only struck out in seven of his first 55 plate appearances. In the series against Oakland before the Tigers came to Seattle, Fielder had seven hits and three walks in 14 trips to the plate. The dude was the definition of on fire. Then, on Tuesday, he struck out four times in five trips to the plate, earning his first golden sombrero since 2009, and only the third of his career. Last night, he struck out five times in six trips to the plate, earning whatever kind of hat is even bigger than a sombrero. It was the first time Fielder had ever struck out five times in a game. On Monday, Fielder had struck out four times in a game just twice in his career. He’s now done it two games in a row. In a game with 40 strikeouts, where guys who hardly ever strike out are going down in flames, you would think that maybe Eric Gregg was calling balls and strikes. Maybe it was just a very pitcher friendly zone, and pitchers were getting the call on anything within the vicinity of the plate. In actuality, it was the exact opposite. From BrooksBaseball, here are the normalized strikezone maps from what Bob Davidson was calling last night. There are a few normal lefty strikes in there, and there’s one pitch down out of the zone that looks generous, but there are more called balls in the strike zone than called strikes outside the normal range. If anything, you might describe Davidson’s strike zone as a little tight in the upper right portion of the zone. And that tight strike zone was never more evident than in Jesus Montero’s 10th inning face-off against Brayan Villarreal. Villarreal, to be sure, does not have great command, and he’s so wild that umpires are probably not inclined to give him the benefit of the doubt when he misses. But, at the same time, Jesus Montero does not have a good eye at the plate. He hadn’t drawn a single walk all year before the 10th inning last night. After Villarreal fell behind 2-0 with pitches that weren’t close, Montero swung at a couple of pitches that were borderline strikes at best, and probably wouldn’t have been called strikes had he not swung. He fouled off a pitch down the middle, then took ball three on the inside edge. Then, Villarreal threw a 97 MPH fastball on the outer half, belt high. In a 3-2 count, Montero took it for ball four. Except, you know, here’s where the pitch actually was. Villarreal was pretty great for the Tigers last year, so perhaps it shouldn’t have been that odd to see him as the third man out of the Detroit bullpen last night. But, after a pretty good debut on April 3rd, here’s how Villarreal’s last three outings had gone. 4-Apr J Willingham 8-B ___ Josh Willingham struck out swinging. 4-Apr J Morneau 8-B 1 ___ Justin Morneau walked. 4-Apr R Doumit 8-B 1 1__ Ryan Doumit doubled to left (Grounder). 4-Apr T Plouffe 8-B 1 _23 Trevor Plouffe lined out to second (Liner). 4-Apr C Parmelee 8-B 2 _23 Chris Parmelee singled to second (Grounder). 4-Apr J Carroll 8-B 2 _23 Jamey Carroll walked. 4-Apr P Florimon 8-B 2 123 Pedro Florimon doubled to left (Fliner (Fly)). 4-Apr A Hicks 8-B 2 _23 Aaron Hicks singled to right (Grounder). 10-Apr J Bautista 7-T 1 _2_ Jose Bautista walked. 10-Apr M DeRosa 7-T 1 123 Mark DeRosa walked. 12-Apr C Young 12-B ___ Chris Young struck out looking. 12-Apr J Donaldson 12-B 1 ___ Josh Donaldson homered (Fliner (Fly)). In his last three outings, Villarreal had faced 13 batters. Five of them walked and five others got hits. The last batter he faced hit a walkoff home run, and that was probably an improvement over the previous outing, where he had to be removed after walking the bases loaded without getting anyone out. He entered the day with an ERA of 48.60 and a BB/9 of 27.00. Yeah, it’s a ridiculously small sample size, but the fact that Jim Leyland trusted Villarreal in a tie game is a little bit amazing. After Villarreal “walked” Jesus Montero, Dustin Ackley sacrificed him to second base. Then Villarreal walked Robert Andino, another player who had yet to draw a walk this year. Gutierrez came to the plate with runners at first and second and one out, but the runner at second was Jesus Montero, almost certainly the slowest runner in baseball. With just one out, Montero couldn’t run on contact, and it would probably take a ball in the gap or down the line to score him. The Tigers outfield was coming home on any play, and Montero had only scored five times in 12 career opportunities from second base on a single. A hit would be nice, but a walk would also push Montero to third, and then he (or a pinch-runner, but we’ll get to that in a bit) could score even on a deep fly ball. Villarreal was struggling to throw strikes, as always. This shouldn’t have been that hard of a plan. Villarreal threw Gutierrez six pitches. These are the locations of those six pitches. The one pitch in the zone was called a strike, and evened out the count to 1-1. Then, Villarreal fell behind with two more pitches out of the zone, and so Gutierrez was ahead 3-1, facing a pitcher who had just walked Jesus Montero and Robert Andino. With runners at first and second, another ball would have put the winning run on third base with one out. Gutierrez swung at a pitch that almost hit him for strike two, then chased a fastball up out of the zone for strike three. He struck out in an at-bat where an extremely wild pitcher threw him one strike. In an at-bat where a walk probably was as good as a hit, given who the runner at second base was. There will probably be a more embarrassing at-bat at some point this season, but given the context and the opponent, this is going to be a strong contender. Now, you might be asking, why was Jesus Montero not pinch run for in that situation. He is, after all, a disastrous baserunner, and the Mariners had Kelly Shoppach available to catch should the pinch-runner have failed to score and the game continued. You’re not going to get too many better scenarios for a pinch runner than replacing Montero in an extra inning home game when he’s on second base and there’s less than two outs. The Mariners are carrying one player who is basically a pinch runner extraordinaire, Endy Chavez. At 35, he’s not the fielder he used to be, and he was never much of a hitter, so he’s just around as a spare outfielder and legs off the bench until Michael Saunders comes off the disabled list. However, Endy Chavez wasn’t available to pinch run, because Endy Chavez had already been used. To pinch hit. Yep, pinch hit. In the 8th inning, with one out and nobody on base, and Max Scherzer still dealing, Eric Wedge sent Chavez up to the plate to pinch hit for Brendan Ryan. Now, Scherzer does have some pretty big left/right splits, and Brendan Ryan is a pretty lousy right-handed hitter, and Endy Chavez is left-handed, so you could kind of see the justification behind this. But, let’s be honest, Endy Chavez is not a significant challenge for Max Scherzer. Even with the platoon advantage, that at-bat was likely to end in an out, especially once you account for the pinch hitting penalty. And it did. Chavez struck out on three pitches. He didn’t even make contact. And then he was replaced by Robert Andino, who had to come into the game to play shortstop in place of Ryan. With a four man bench, Eric Wedge used his pinch runner to pinch hit in a situation where he probably didn’t gain much of an advantage, and even if he had gotten on base, it probably wouldn’t have mattered that much, given how Scherzer was pitching and the M’s were hitting. The Mariners used half their bench so that Endy Chavez could strikeout against Max Scherzer on three pitches. But that wasn’t even Wedge’s largest tactical mistake of the game. In the ninth inning, Octavio Dotel replaced Scherzer. Kendrys Morales led off with a base hit, and then Michael Morse drew a walk, pushing Morales to second base. Jason Bay was called on to pinch run for Morales. With nobody out and the winning run on second base, Raul Ibanez was due up, so Jim Leyland went and got left-handed specialist Phil Coke to face him. You probably don’t need to be reminded that Phil Coke is death on left-handers and Raul Ibanez can’t hit left-handed pitching. Post season heroics or not, this was a terrible match-up for Ibanez, and the obvious call here was a sacrifice bunt. If Ibanez could get the bunt down, Bay would be on third base with one out, and the Mariners had two right-handers coming up to either force Coke from the game or give the team a very large platoon advantage. Raul Ibanez, clutch veteran, was told instead to swing away. Raul Ibanez grounded into a double play. The Mariners win probability dropped from 79.2% to 60.8%, the biggest swing of any play in the Tigers favor all night. Instead of just needing a fly ball to give Bay a chance to score, now the Mariners needed a hit. Justin Smoak struck out. Inning over. It is not often that FanGraphs will criticize a manager for not laying down the sacrifice bunt, but if ever you were going to give up an out, having Raul Ibanez give up an out against a very tough left-handed reliever to move the winning run from second to third base would be when you wanted to give up that out. The sacrifice bunt is not always the wrong call; it is just generally overused by major league managers. Last night, it was the right call, and it was underused. But, you know, this game wasn’t done with weirdness. 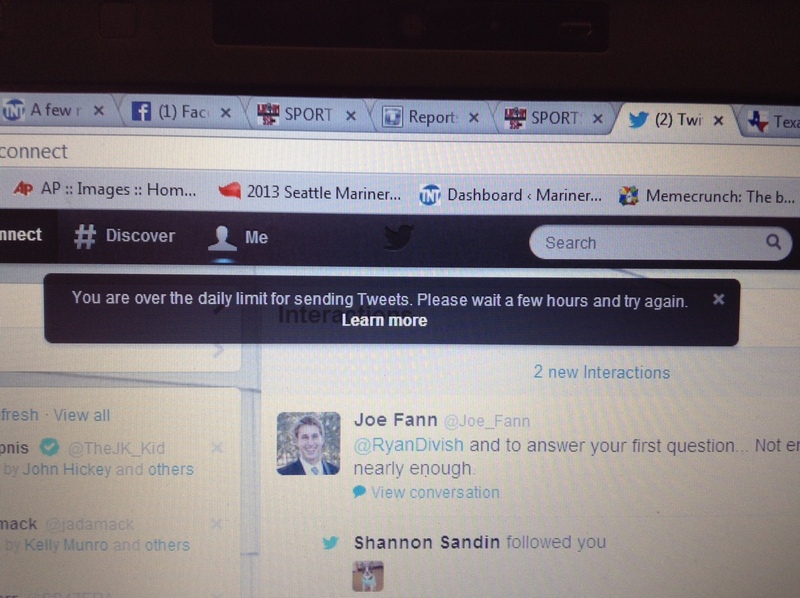 Ryan Divish, beat writer for the Tacoma News Tribune, is a prolific tweeter. He has a knack for going to games that last a very long time. One might even call it a curse. Ryan Divish was at last night’s game. Ryan Divish was tweeting about all the weird things happening. And then, Ryan Divish was not tweeting any more. In the top of the 14th inning, Ryan Divish went silent. Because Twitter had enough of Ryan Divish. That’s right, the game went so long that Twitter put one of the Mariners beat writers in the penalty box for tweeting too much. A game this weird could only end weirdly, so after the Tigers took a 2-1 lead in the top of the 14th, the Mariners had one last chance to tie it up. Justin Smoak singled off Joaquin Benoit with one out, putting the tying run on base. After Jesus Montero popped out, Dustin Ackley came to the plate. Dustin Ackley has been utterly lost as a hitter this year. He had 52 plate appearances and no extra base hits. He was hitting .125/.188/.125. He had already junked his mechanical changes from spring training and decided to go back to his old setup at the plate. Benoit threw Ackley an 86 mph change-up, and Ackley lined it down the right field line for a double. Justin Smoak was running on contact, since there were two outs and all. Justin Smoak decided to try and score on the play. This happened. The Tigers won the game by allowing Dustin Ackley to get his first extra base hit of the year, so that they could throw Justin Smoak out by 20 feet. This was a baseball game, in April, between two teams with very different 2013 expectations. This game didn’t really matter, but what a game it was. Baseball. We hoped you liked reading The Most Epic Game That Didn’t Matter by Dave Cameron!